Sarah Palin's Alaska ratings decreased by nearly 50% during the second week of her reality show, which indicates that some of the buzz about her show has died down. However, there were likely millions who watched the first week because they had to - either or school, for work, to blog about, to critique - and more. One Fox News affiliate anchor said that Palin's show was like "The Sound of Music" without the Nazis - or the music. 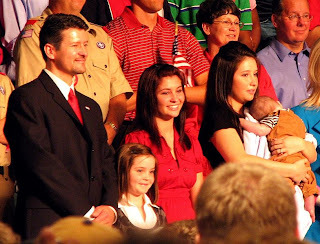 As far as reality TV shows go, Sarah Palin's show offers something that I haven't ever seen before - a seemingly normal American family just enjoying each other. They aren't a family of "little people", it's not a show about someone with multiple spouses, and it's not about someone who has given birth to a litter of children. It's refreshing to see a normal family interact. I don't expect excitement - just an educational hour escape from reality (after watching Kendra). Although Sarah Palin's Alaska ratings decreased, viewership remains strong. Can't help but wonder how many will tune in to tonight's Dancing with the Stars finale!